Who would have thought long sequences of people riding bikes could be so entertaining? I realize it's the oldest trick in the book to open with a question to draw a reader in but that was the question I kept repeating to myself every time Premium Rush continued to surprise me. The film had become a sort of throwaway piece of entertainment as there was no real push in its advertising campaign to give it any real chance of reaching a broad audience to embrace it, but I don't know why. This is a thrilling little piece filmmaking that doesn't take itself too seriously and whips by as fast as its characters do in the streets of New York. Many movies will claim that the setting is another character in itself and seldom does that ring as true as it does here. Everything about the film is influenced by its setting and for those of us that have never been to New York ourselves it is a fascinating, ground look at the pace of the city and the atmosphere it breathes. The films running time is a mere 90-minutes and the adrenaline never stops pumping that entire time. The plot unfolds with a non linear fashion that keeps us guessing even if we might see where the film is heading a scene or two ahead of it actually getting there. It doesn't go down the normal, easy route of dealing with any kind of drug or generic road that makes us care less about the story and care more about the action but instead sets itself up for the challenge of having its characters being as invested in their quest as we should be in the film. It may not serve as any metaphor for something bigger going on in the world right now, it isn't addressing any political issues outright and in general seems to have no agenda other than to entertain. Sometimes that is all you need. And with a cast led by two greats such as Joseph Gordon-Levitt and Michael Shannon you really can't go wrong no matter what kind of movie you're making. Ramirez) hide from the cops in their race against the clock. While I expected nothing flashy from the film other than the way in which the chase sequences were filmed, I was pleasantly surprised to find that Premium Rush was not simply going to tell its story and insert a few cool sequences in between. In short, I was delighted that the film was actually going to be a thinking persons film. It starts out blasting those opening chords of The Who's "Baba O'Riley" and immediately jumps into this slow motion shot of Gordon-Levitt flying through the air and landing on the pavement in a state of confusion surrounded by concerned pedestrians and then a girl, close to tears drops in frame and is trying to keep Gordon Levitt's Wilee from slipping into unconsciousness but of course, he does. The film operates within a slim time frame. Starting initially at 7:30 and working its way back to 5:00 and then 3:30 to tell the complete story that includes all of the facets the story includes. There is some narration from Wilee in the beginning that educates us on the ins and outs of bicycle messaging and the complications that ensue in a city of speeding cars, cabbies (all of which include the nuisance of open doors at one time or another), and all those pedestrians walking the streets. The film quickly exemplifies these obstacles by showing Wilee's pre-meditated visions of how certain routes could end, most of which do with him hitting the pavement. He is in an on the rocks relationship with fellow messenger Vanessa (Danis Ramirez) while another of his fellow cyclists Manny (Wole Parks) insists on constantly trying to show him up in competing for Vanessa's affections and his status as the best messenger in the city. It is when Wilee picks up an envelope from Vanessa's roomate Nima (Jamie Chung) that things start to deviate from the everyday routine. Wilee doesn't know what he's delivering, he just has a destination and a time to have it there by. That is all he needs to know and that is all he cares to know. Nima makes it clear the contents of the envelope are of the utmost importance and NYPD officer Bobby Monday seems to know why. From the moment Wilee is set to deliver the envelope Monday is on his case, chasing after him for reasons unknown. As Monday, director David Koepp (mainly known for his writing but has also directed the small charmers Ghost Town and Secret Window) has somehow managed to gather Michael Shannon to star in this slickly made if easily not seemingly forgettable film. Shannon, who is usually known for smaller projects or supporting roles turns up the intimidation here for what might be a little glimpse of how the actor will portray his villainous turn in Man of Steel next year. Not to get off topic, Shannon portrays the impulsive and angry detective with a flair for the dramatic and an overriding sense of entitlement that ultimately keeps the chase going and the complications piling. While Shannon hams it up with glee it is apparent he knows the kind of movie this is, but what separates he and Gordon-Levitt is that despite the younger leads understanding of what kind of film this is he still completely commits to making the guy the most genuine interpretation of the character he can. If there is one thing to be said for Gordon-Levitt and his sudden rise to the top of everyone's favorite list it is how versatile he is. Whether it be big budget actioners like Inception and The Dark Knight Rises, small indie fare such as (500) Days of Summer and 50/50, or even his underrated turn in Hesher and the upcoming sci-fi flick Looper, I don't know that the guy can make a bad film. It was with both an element of surprise and appreciation that I took in Premium Rush with as much energy as it offered up. The added weight of the exposition lends the film a credibility it would have likely not had otherwise. It is a formula film that exceeds its own constructs. It speeds along at such a quick pace you don't have time to question its logic or look deeper into the lives these messengers lead. In short, it is more than I expected it to be. I went in expecting a forgettable, formulaic action movie and that would be the end of it. Coming out it is indeed all of those things, but what I didn't expect was to enjoy the journey of it as much as I did. I would watch it again, probably several time just because it is that entertaining and that fun. There may be an easier way to say that Koepp and his crew knew what they were making and didn't intend to leave any kind of mark or make any kind of statement with the film, but in the end it does turn out to be more of an experience than a distraction which lends to it being more than it may have ever intended to be. There is a certain weight to it that wouldn't come if we tried to put on the breaks as our protagonist always advises against. We simply take it in and accept it for what it is while marveling at the break-neck action sequences that see our heroes weave through the streets of New York all while communicating a story (props to the actors for delivering most of their dialogue while on the go). The film has an essence that takes you in whether it be the thickness of the plot, the characters, or just that hot summer day in New York City where we get a glimpse into the underground world of these bike messengers. 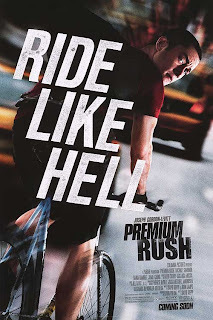 You may not take much away from Premium Rush except for a desire to ride a bike more often, but no one can argue that it does in fact, deliver.